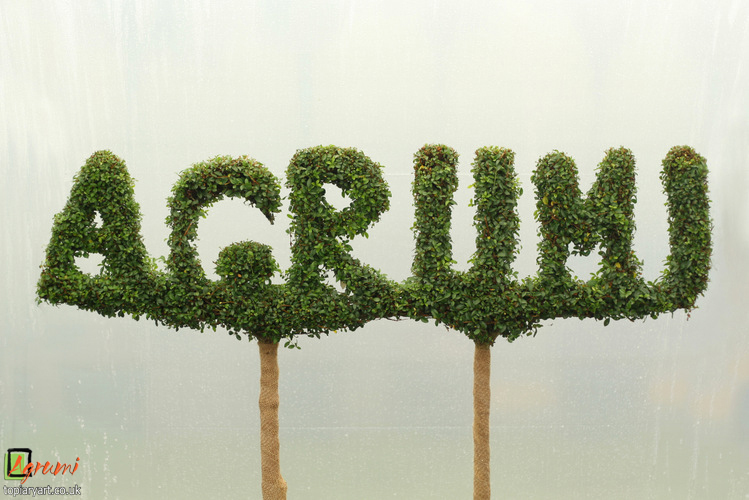 Agrumi supplies a comprehensive variety of top-quality large specimen shrubs, ornamental and architectural trees and screening up to six metres. We also pleach, prune and shape trees and hedging, but our specialty lies in creating custom-made plant sculptures for any space and budget. We undertake almost any bespoke topiary commission combining our expertise with our clients’ ideas to create designs that delight, surprise and inspire. Take a look at our catalogue to get an idea of some of the commissions we have undertaken over the past year. We also have a huge portfolio of ready-made topiary designs including animals, fantasy characters, bikes, boats, cars, planes, trains, words, letters and numbers. We handmake all our bespoke and ready-made topiary at our family-run nursery located in the beautiful New Forest. We create and ship all our designs direct. Having no third-party supplier means our topiary is quick to make, greener, healthier and cheaper than others on the market. We prefer to make our designs in living plants, but artificial coverings are also possible – We cater to almost any design need and work closely with clients to guarantee graceful enhancement of your space without breaking the budget. Our Director Stanley Jackson learned his horticultural know how from experts when he lived and worked in Italy. Stan and his team ensure that all customers get their plants in perfect condition through the best possible customer service. To be inspired or simply to find out more please browse our site and have a look at what we can offer you. You can also make enquiries quickly and easily by heading to our contact page. Stanley and the team at Agrumi look forward to your email or phone call! Funding was awarded for a purpose built, dedicated all-weather structure for the construction of life-sized topiary structures.